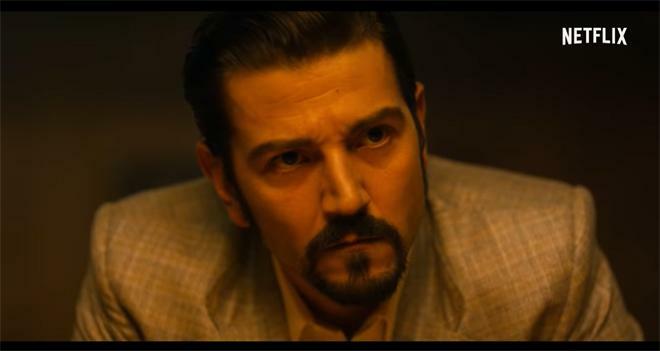 A preview for the latest season of Narcos leads this week's crop of streaming trailers. CBS All Access, Amazon Prime Video, and Netflix have all released new previews and info for several of their upcoming programs and films. Derren Brown: Sacrifice (Netflix, October 19) - Celebrated psychological illusionist Derren Brown returns with a new Netflix original special in which he attempts to radically transform, through the use of covert psychological techniques, one man's prejudices. Spanning two continents and drawing on the expertise of actors, stunt coordinators and ballistic experts, Derren creates a scenario in which his subject has to decide whether or not to make the ultimate sacrifice: laying down his life for a complete stranger he wouldn't normally identify with. Adam Sandler: 100% FRESH (Netflix, October 23) - Adam Sandler takes his comical musical musings back out on the road, from comedy clubs to concert halls to one very unsuspecting subway station. Bodyguard (Netflix, October 24) - Set in and around the corridors of power, Bodyguard tells the story of David Budd (Richard Madden), a heroic, but volatile war veteran now working as a Specialist Protection Officer for London’s Metropolitan Police Service. When he is assigned to protect the ambitious Home Secretary Julia Montague (Keeley Hawes), Budd finds himself torn between his duty and his beliefs. Responsible for her safety, could he become her biggest threat? The Degenerates (Netflix, October 30) - Warning: You may find this show extremely hilarious or incredibly offensive. Ready to roll the dice? A series of no-holds-barred comedy from the likes of rising comics like Big Jay Oakerson, Joey Diaz, Liza Treyger, Yamaneika Saunders, Christina P. and Brad Williams. Super Drags: Red Band Slayage (Netflix, November 9) - Three queens serve fierce looks and take on evil. Whether they’re facing a shady customer, or outright bigotry, these queens are ready to spread their glitter and twerk away the shade. Narcos: Mexico (Netflix, November 16) - This raw, gritty series chronicles the gripping real-life stories of the drug kingpins of the late 1980s and the corroborative efforts of law enforcement to meet them head on in brutal, bloody conflict. It details the many, often-conflicting forces - legal, political, police, military and civilian - that clash in the effort to control cocaine, one of the world's most valuable commodities. The Kominsky Method (Netflix, November 16) - The sun isn’t setting yet on the once famous Sandy Kominsky and his longtime agent Norman Newlander. Academy Award® Winners Michael Douglas (Kominsky) and Alan Arkin (Newlander) star as two friends tackling life’s inevitable curveballs as they navigate their later years in Los Angeles, a city that values youth and beauty. Both comedic and emotional, The Kominsky Method is an 8-episode, half-hour single camera show created by 8-time Emmy Award Nominee Chuck Lorre. The Final Table (Netflix, November 20) - A global culinary competition show featuring the world’s most talented chefs fighting for a spot at the elite, Final Table made up of the greatest chefs from around the globe. The series features 12 teams of two chefs from around the world cooking the national dishes of Mexico, Spain, England, Brazil, France, Japan, the U.S., India and Italy. Each episode focuses on a different country and its cuisine, with celebrity ambassadors, food critics and the country’s greatest chef eliminating teams until the finale. In that last episode, only one of our competing chefs will win a place at the Final Table, joining the nine legendary culinary icons -- Enrique Olvera (Mexico), Andoni Aduriz (Spain), Clare Smyth (UK), Helena Rizzo (Brazil), Vineet Bhatia (India), Grant Achatz (US), Carlo Cracco (Italy), Yoshihiro Narisawa (Japan) and Anne-Sophie Pic (France). Baby (Netflix, November 30) - A coming-of-age story that explores the unseen lives of Roman high schoolers. Loosely inspired by a true story, the series follows a group of Parioli teenagers as they defy society in their search for identity and independence against the backdrop of forbidden love, family pressures, and shared secrets. Diablero (Netflix, December 21) - The eternal fight between good and evil among devils and angels in the colorful streets of Mexico will open the door to a fantasy world never seen before, where anything can happen. The horror and supernatural thriller centers around Father Ramiro Ventura, a priest who finds himself seeking the aid of legendary "diablero" or demon hunter Elvis Infante. With the aid of Nancy, a modern day superhero, this improbable trio lives in a constant battle between two worlds that exists within and sets in motion a series of events that could determine the fate of mankind. Along the way, they will trap and sell demons, fallen angels, and otherworldly creatures in a black market linked to an underground fighting circuit. Patriot: Season 2 (Amazon Prime Video, November 9) - John must make a choice at the train platform — be free from his obligations and adversaries by letting Agathe take the money or pursue her, at great risk to himself, in an effort to protect his brother, father, and country. Meanwhile, his father presents a perilous way out of it all: find and assassinate Cantar Walley in Paris. Tell Me A Story (CBS All Access, October 31) - Set in modern-day New York City, the first season of this serialized drama interweaves "The Three Little Pigs," "Little Red Riding Hood" and "Hansel and Gretel" into an epic and subversive tale of love, loss, greed, revenge and murder. The cast includes James Wolk, Billy Magnussen, Dania Ramirez, Danielle Campbell, Paul Wesley, and Kim Cattrall.